Thanks to Kyle, our multi-talented Qmulite, we recently received a custom, hand-made, wood sign for our new office. For 15 years, Kyle has been perfecting his woodworking skills. He is always one to seek out a challenge and creating the Qmulos sign was no different. He completed the masterpiece in a single weekend using everyday wood pallets and his keen, creative eye. To begin, Kyle refined the materials by cutting off the boards and pulling out the nails. Next, he flattened the wood with an electric hand planer, and then used a thickness planer to ensure all the boards were the same width. 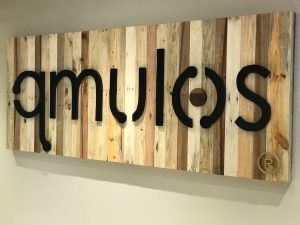 The advantage of using pallet wood is each panel has a different grain pattern giving the sign a unique look. Kyle chose to alternate between light and dark boards to create a rustic backdrop. To create the logo, Kyle used underlayment, a thinner type of wood made from sawdust. He meticulously cut out each letter individually and painted them before placing them on the pallet wood. The custom-made sign was the perfect finishing touch to our new office and hangs in our entrance hall, greeting every visitor. Thanks to our talented team members, the Qmulos brand will continue to proliferate across the world!